Linear makes the only aluminum USS recumbent bicycles Made in the USA today! In 2002 we purchased the assets of Linear in Iowa and moved them to western New York. Before we built our first Linear in New York we began a long overdue structural redesign of the Linear Long wheelbase recumbent. 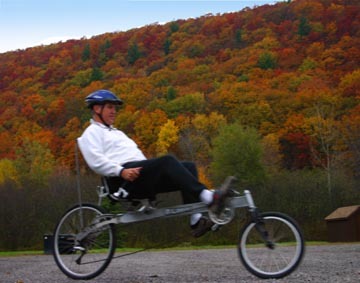 We started by buying broken pieces of Linear recumbent bikes built in Iowa between the 1985 and 2001. We analyzed them to see what was breaking and what forces were causing them to break. We created computer 3d models of the Iowa frames and applied the forces a real bike experiences on the road to it. We used computer FEA analysis of the Iowa frame to see how it would respond to these forces. Now we had a computer model but was it accurate? We took a Linear frame into the lab and measured its vertical rigidity and horizontal to check the accuracy of this model. The model was quite accurate so we moved on. We added a horizontal gusset to the rear of the frame and measured it’s horizontal rigidity with and without the gusset. It was about four times as rigid with the gusset! We worked with Dr. Steve Mays and his senior engineering students for three semesters designing the prototype of what became the Linear Limo. 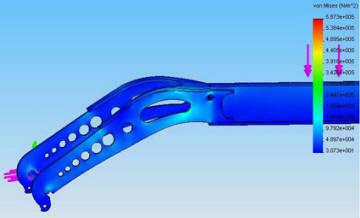 This design process made extensive use of using computer aided FEA design. We built a prototype of this new design and to verify that we had designed it for the correct forces a bike is subjected to on the road we attached strain gauges and accelerometers to its frame and hung a laptop computer behind the seat. This bike was raced through potholes, off curbs and up hills by a 240 lb rider. After looking at all this info we felt confident it was strong so we invited dozens of our customers test ride it and give us feedback. They liked it! Next we loaned this prototype to a 250 lb friend who rode it 800 miles then strapped on an additional 50 lbs of gear and rode over 1100 miles from Maine to Georgia. When he arrived in Georgia he returned it to us for inspection. We stripped it to the bare frame and visually inspected it for visible damage but found nothing more than cosmetic scratches. We hired a certified inspector to perform a dye penetrant test, looking for tiny fatigue cracks we could not see otherwise. His report found that the New Linear Limo frame passed nuclear specifications with one exception. Based on this report we redesigned the one problem area to eliminate the possibility of the same thing happening to any of the Linear frames we sold to our customers in the future. Was strong enough to survive thousands of miles of riding, even loaded with a large rider and their touring gear. We spent another semester refining the frame design. 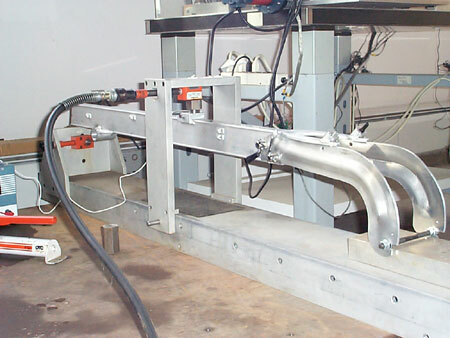 We wanted to strengthen it a little more and worked out a few manufacturing details including designing and building the tooling to machine and weld Linear Limo here in New York. Chris, the owner of Limo #1 gave us valuable feedback after over 5000 miles of riding. For instance, he found the rear Avid BB-5 disk brake pads had to be replaced after only 3,000 miles so we upgraded and now use the BB-7 for easier adjustment and longer pad life. 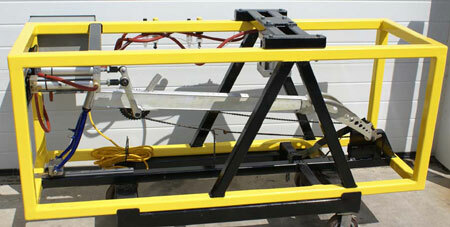 Our in house fatigue tester ready for testing Linear frames. Working with a Linear owner who is also a professor at Purdue we enlisted a group of Purdue students to design and build a 400 lb fatigue tester. This machine will simulate hundreds of thousands of road miles by repeatedly placing loads up to 1600 lb on the seat and 300 lb on each pedal. As of 2014 we have tested 6 Linear frames to failure. We tested a seventh frame but were unable to break it, even after 1,500,000 pressure cycles on the seat. This testing provides us with invaluable information showing us how we can further improve our bikes. We prefer to test our designs before selling them to our customers. We figure in the long run this is better for our customers and for us.